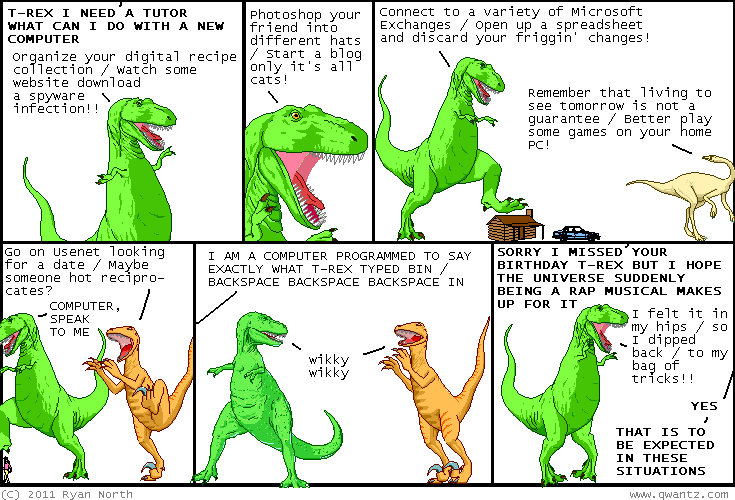 Dinosaur Comics - October 21st, 2011 - awesome fun times! October 21st, 2011: Kate updated her comic! This update is special for me because one time she was like "What Marvel hero should I write abou-?" and I was all, "KRAVEN", and here is that short anecdote presented much better in Kate Comic Formatte! One year ago today: this is me arguing that a url of a website can be as great of a present as a book. in other news, be sure to keep an eye out for my new dinosaur comics book, coming out in a few weeks!